That’s right! 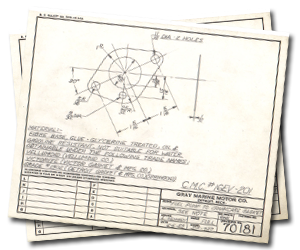 We have the original hand drawn mechanical drawings that the original gaskets were made from. Therefore, you know our gaskets are going to fit everytime! We’ve had numerous customers call us up with gaskets purchased elsewhere that have holes that don’t line up, missing openings, etc. Not with our gaskets made from the original drawings, a perfect fit, every time. Give us a call and let us know what you need!